The Olympics start on Friday. 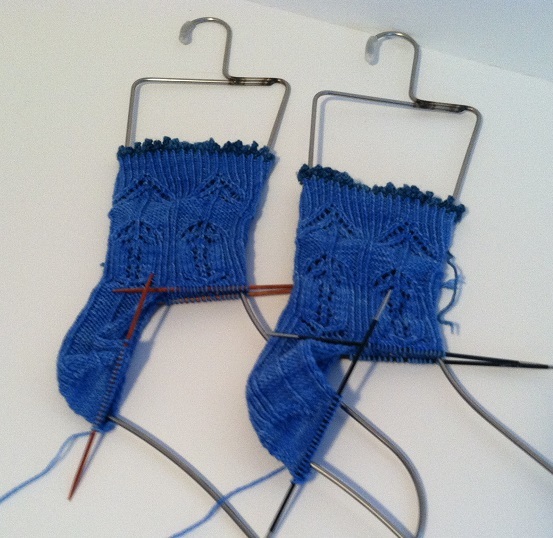 Which means the Ravellenic Games on Ravelry start on Friday. And I’m no closer to figuring out what my project will be. It has to be a challenging project to knit. Something that will be difficult (but do-able) to finish in the 17 days of the Olympics, from the start of the opening ceremonies until the flame goes out at the closing ceremonies. While deciding, I have to take into account things like babysitting time (but allowing for knitting time during naps), class teaching time, an already scheduled lunch with friends, writing the blog, and oh yeah knitting three other knit-a-long projects as their clues come out. And again, this is all self-imposed. I realize that. But it’s what I do, and it’s fun. Honest. Don’t feel like you have to go look at all those. But if you do, feel free to give me your opinion about them! I just wanted to show you what a problem I’m having deciding what to do. At any rate, I have a couple more days to figure it out. Then I have to get all my supplies: pattern ordered, yarn picked out (and hopefully from my stash…but just in case I need to factor in time to shop for yarn), needles, etc. Oh the pressure! And I’m sure I’m not the only one going through this. Yet another example of how crazy knitters can be. 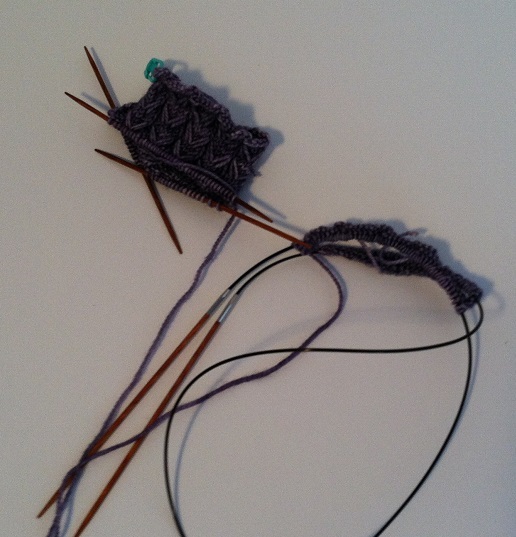 I decided to use Tosh Sock by madelinetosh in the colorway “logwood”. It is a superwash merino yarn and a really nice yarn to work with. I like most of madelinetosh yarns. The colors are great and the yarn is soft. Since I’m doing two sock knit-a-longs, I ran out of size 1 DPN’s so I had to use a long 40″ circular and do the magic loop method for one of these. And so far, I’m loving this pattern. That stitch is a new one to me – wrapping yarn around the needle three times, slipping that stitch for a few rows, then incorporating it into a cable – which made it so fun. And I finished my second Garter Ear Flap Hat! This is the adult medium but I think it came out larger than it was supposed to, maybe to the large measurement. And there is my creepy Styrofoam head again. Remember how I said it was too small? There is your proof. It doesn’t fit an adult hat. Whoever made it is a weirdo. I have, frustratingly, lost the ball band for this yarn so I can’t tell you anything about it except the colorway is, fittingly, “Monet”. 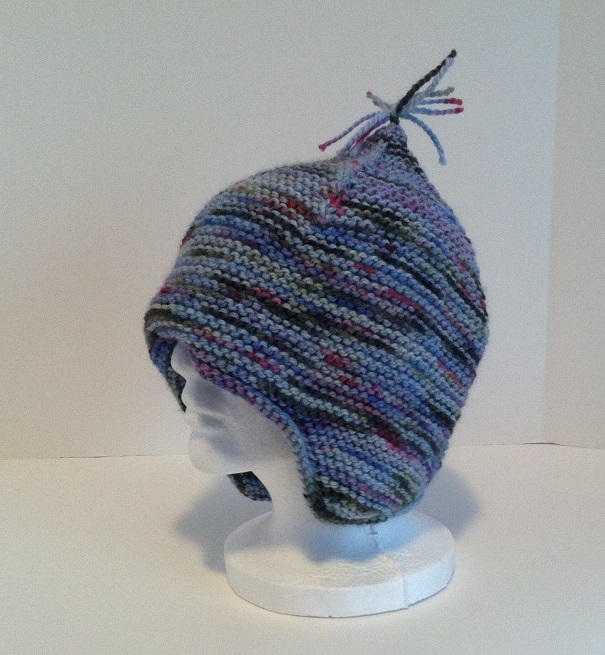 And I loved working with it -so soft and it makes for a very cozy hat. It was a quick knit, only taking me 3 days. Stay tuned for my Ravellenics project picking updates – riveting stuff coming up. Posted in Uncategorized and tagged cocktails for two, garter ear flap hat, knitter's brewing company mystery sock VI KAL, ravellenic winter games 2014, through the loops kal 2014 on February 3, 2014 by lizytish. I vote for Color Affection or Dark & Stormy. 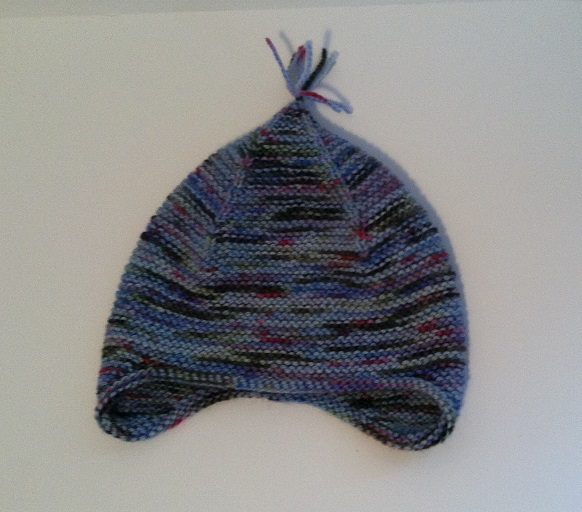 As for the hat, if it’s too big you could put a felt lining in it – super warm! Well, I ended up with Charleston Tea – another Thea Coleman design, since that is what I had yarn for! I also like Dark & Stormy. There’s no way I could finish that in 17 days, but I’m sure you could! Bitterroot is really pretty and I have always wanted to knit the Color Affection shawl. Good luck! Turns out I didn’t have enough yarn for Dark & Stormy so I’m doing Charleston Tea!